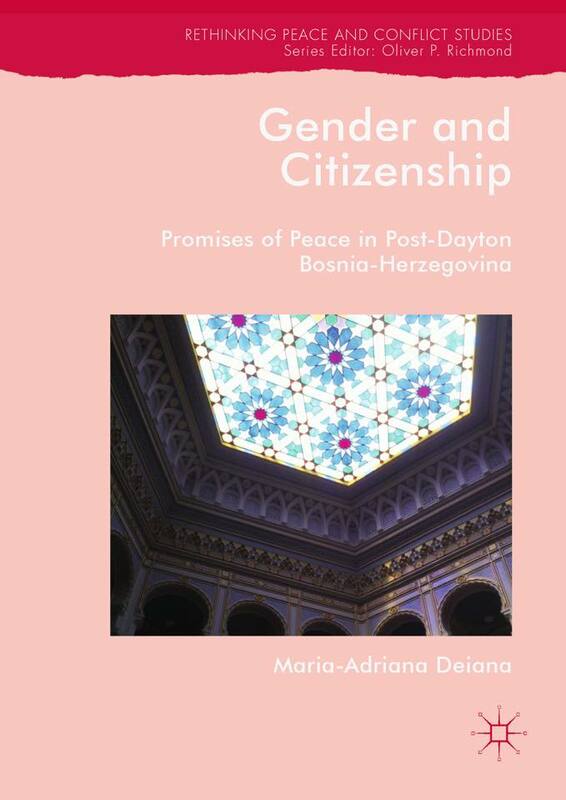 Gender and Citizenship: Promises of Peace in Post-Dayton Bosnia-Herzegovina is the latest book by Dr Maria-Adriana Deiana, IICRR Fellow and Lecturer in Gender Studies at Queens University Belfast This book examines the remaking of women’s citizenship in the aftermath of conflict and international intervention. It develops a feminist critique of consociationalism as the dominant model of post-conflict governance by tracking the gendered implications of the Dayton Peace Agreement. It illustrates how the legitimisation of ethnonationalist power enabled by the agreement has reduced citizenship to an all-encompassing logic of ethnonational belonging and implicitly reproduced its attendant patriarchal gender order. Foregrounding women’s diverse experiences, the book reveals gendered ramifications produced at the intersection of conflict, ethno-nationalism and international peacebuilding. Deploying a multidimensional feminist approach centred around women’s narratives of belonging, exclusion, and agency, this book offers a critical interrogation of the promises of peace and explores individual/collective efforts to re-imagine citizenship.